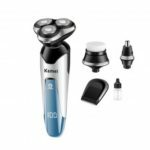 The KM-6620 Hair Trimmer is a 4 in 1 multifunctional electric tool for trimming beard, sideburns, nose and also with eyebrow hair. 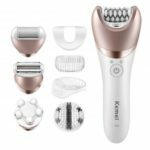 It allows the entire head to adjust to any angle and the active contour and keep blades in close contact with your face, ensuring reduced irritation and an accurate shave without hurting to your skin. Get it now and have a total grooming in the palm of your hands! Made of high grade material, durable, safe and eco-friendly. 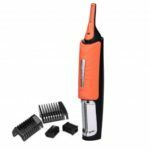 4 in 1 hair trimmer equipped for nose hair trimming, ear hair trimming, eyebrow cutting and also beard shaving, provides you with full and clean grooming. 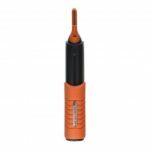 360-degree all-round nose hair trimming head helps to capture and trim the nose hair where is unable to reach without hurting your skin. 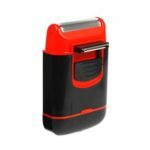 Round blade for safe eyebrow trimming and the unique beard shaver head design provides a very clean effect for shaving your beard. Washable and removable, the cutting head can be simply changed and cleaned up under the faucet. Provide quick and painless trimming for you, easy and convenient to use.